There was no shortage of amazing outfits on the American Music Awards red carpet Tuesday night. But the award for best dressed has to go to AMAs host Tracee Ellis Ross who wore 12 different outfits! The "Black-ish" star kept us on the edge of our seat all night, anxiously awaiting her next ensemble, and let's just say she didn't disappoint. The actress broke out a diverse range of looks, all crafted by black designers, and pretty much killed it. Which look was her best? Decide for yourself and check out each of her 12 outfits below! Ross got a head start the night before the AMAs, wearing a hot pink suit with an Egyptian-inspired print to kick off the awards show. 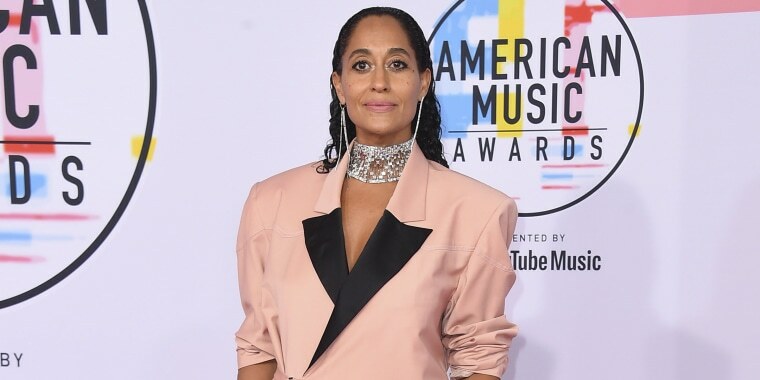 The Black-ish star opted for another pink suit, this time by designer Pyer Moss in a blush color, for the main red carpet and paired the look with a choker and earrings. The actress made a fashionable statement in a T-shirt paired with a sassy red ballgown skirt. The funny lady showed off her glam side in a sparkly Balmain tuxedo gown with a thigh-high slit. The 45-year-old isn't afraid of a bold look, as she proved in this head-to-toe leopard ensemble. Ross made her disco diva mom, Diana (yes, that Diana Ross! ), proud in a megawatt golden gown. Few people could pull off a cape paired with a shimmering bodysuit and sneakers, but on Ross, the outfit looks totally effortless. Ross looked simply stunning in this tulle Off-White gown, the same hip fashion brand that created Serena Williams' tennis tutu. What's red, blue and ruffled all over? This stunning V-neck gown with some major sleeves! The actress combined two of our favorite things — suits and dresses — into one eye-catching look. Ross made a lasting impression with her final look: a red off-the-shoulder Cushnie jumpsuit.